I can say that this is a pretty good budget TV, which functionality can compete with more expensive models. 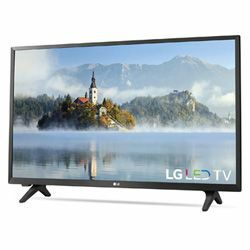 According to the LG 32LJ500B specs, it has everything you need for a modern LCD TV: a large 32-inch screen with HD image quality and all major video and audio formats support. But the main feature of this TV from other budget models in the expanded functionality due to the operating system WebOS 3.5 Smart TV and the Color Master Engine and the Virtual Surround functions. This is 2017 year model TV from LJ500 series. This is a popular LG series of budget TVs at a very affordable price that does not exceed $ 300. The main and unique technology is Dynamic Colour which brings out greener grass, bluer skies, richer color all around, better than ever thanks to this special process that enhances the entire wheel - red, green, blue, cyan, magenta and yellow - as well as their hue and luminance. A very affordable price for the extended functionality ( is about $ 350). Very comfortable operating system WebOS 3.5 Smart TV. Color Master Engine and Virtual Surround functions which enhances the image and sound quality. Dynamic Colour technology which enhances the colors quality. For the TV of 2017, it would be able to have at least a full HD. Doesn’t support MOV video format.